It's rare that I find an eye cream worth mentioning. You may have noticed that I've only done it a handful of times -- with Prescriptives, Estee Lauder, Kiehl's and of course, La Mer. Well, it's time for me to add one more eye cream to the list. 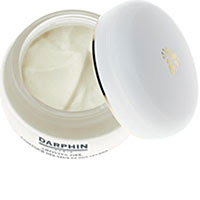 Darphin Arovita Eye & Lip Contour Gel. This eye cream makes my list for many reasons, but let's start with the fact that it's an unbelievably nourishing and creamy gel. It's lush and thick but not greasy, and it sinks into skin immediately, making it good for day or nighttime use. Avocado oil, chamomile, orchid and rose extracts, and jojoba seed oil are the main ingredients that make up this gel. It smells unbelievably fantastic -- it actually reminds me of that comforting spa smell I love. And these ingredients all work to moisturize, nourish and hydrate the skin. It even depuffs after a late night out! Now, I haven't used it on my lips, so I can't speak to whether it reduces fine lines and wrinkles there. But I will say that my under-eye area looks fresher and more youthful since I started applying it nightly! The wrinkles appear finer, the dark circles appear lighter, and I swear I've been carded more since I've used it. I was actually told I look no older than 22 twice this week. Coincidence? I don't think so.